Marian Central came back from a 17 point deficit in the first quarter to defeat visiting Montini 49-24. 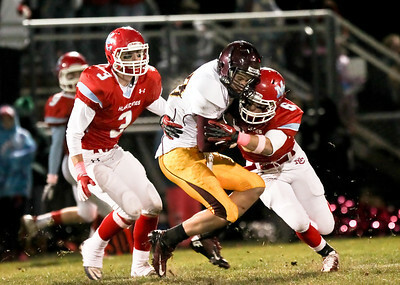 Josh Peckler - Jpeckler@shawmedia.com Marian Central's Ryan Hickey gets tackled by Montini's Charles Long while running the ball during the second quarter at Marian Central High School Friday, October 5, 2012. Marian Central won the game 49-24. 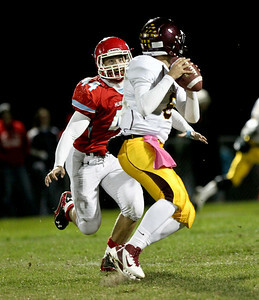 Josh Peckler - Jpeckler@shawmedia.com Marian Central's Thomas Lesniewski (44) stares down Montini quarterback Alexander Wills right before sacking him in the first quarter at Marian Central High School Friday, October 5, 2012. Marian Central won the game 49-24. 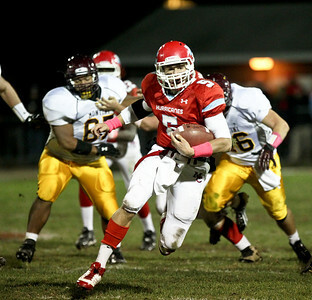 Josh Peckler - Jpeckler@shawmedia.com Marian Central quarterback Chris Steveler runs with the ball during the second quarter against Montini at Marian Central High School Friday, October 5, 2012. Marian Central won the game 49-24. 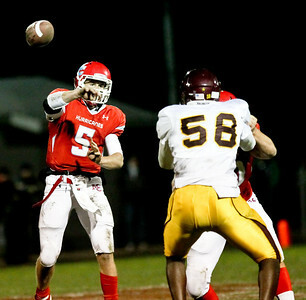 Josh Peckler - Jpeckler@shawmedia.com Marian Central quarterback Chris Streveler throws the ball during the second quarter against Montini at Marian Central High School Friday, October 5, 2012. Marian Central won the game 49-24. Josh Peckler - Jpeckler@shawmedia.com Marian Central's Tom Klinger (3) and Tony Milone (6) stop Montini's Tyler Tumpane after he received a pass in the first quarter at Marian Central High School Friday, October 5, 2012. Marian Central won the game 49-24. 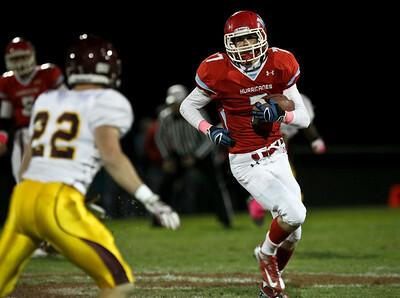 Josh Peckler - Jpeckler@shawmedia.com Marian Central's Tommy Waytula runs with the ball during the second quarter against Montini at Marian Central High School Friday, October 5, 2012. Marian Central won the game 49-24. 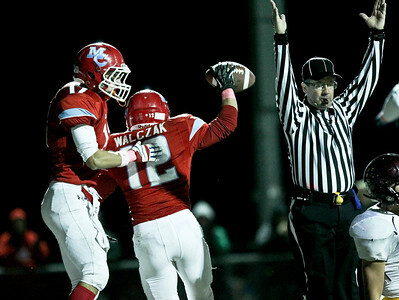 Josh Peckler - Jpeckler@shawmedia.com Marian Central's Greg Wolczak (12) celebrates with teammate Brett Olson after he scored a touch down in the first quarter against Montini at Marian Central High School Friday, October 5, 2012. Marian Central won the game 49-24. 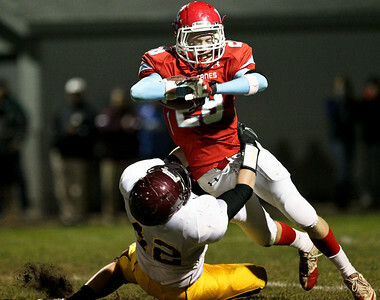 Josh Peckler - Jpeckler@shawmedia.com Marian Central's Ephraim Lee tries to gain some extra yards after being hit by Montini defenders during the first quarter at Marian Central High School Friday, October 5, 2012. Marian Central won the game 49-24. 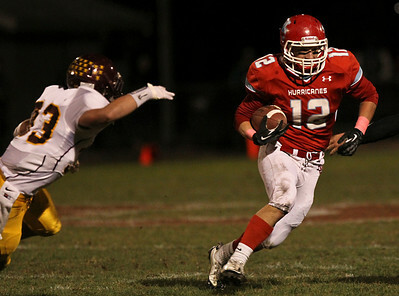 Josh Peckler - Jpeckler@shawmedia.com Marian Central's Greg Walczak runs with the ball during the second quarter against Montini at Marian Central High School Friday, October 5, 2012. Marian Central won the game 49-24. 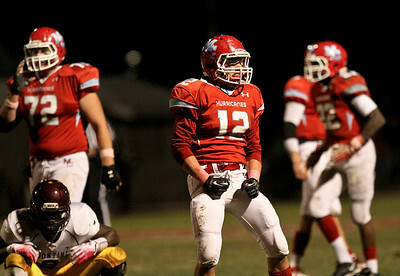 Josh Peckler - Jpeckler@shawmedia.com Marian Central's Greg Walczak celebrates making a tackle for a loss during the second quarter against Montini at Marian Central High School Friday, October 5, 2012. Marian Central won the game 49-24. 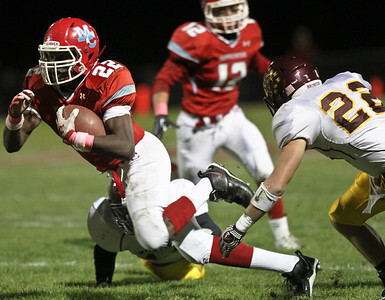 Marian Central's Ryan Hickey gets tackled by Montini's Charles Long while running the ball during the second quarter at Marian Central High School Friday, October 5, 2012. Marian Central won the game 49-24.